As I sit here writing in Eva’s baby book, I’m a bit sad to realize how fast this past year+ has gone! 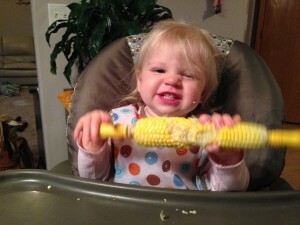 My little baby girl is already a bit over 15 months old and she’s showing us new tricks every day! In the past week we have heard her vocabulary go from 4 words (uh oh, hieee, mama and uh uh) which she’s been using for a good month to 9-10 words! (add in ‘gama’ (for grandma), puppy, kitty, ‘yeeyee’ (for Lilly), owie and ‘ah duh’ (for all done). 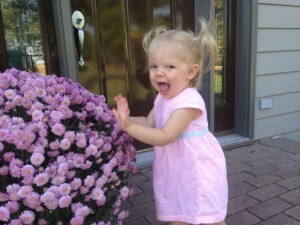 She’s also grasping on to the meaning of sign language and loves to use the sign for “all done”, “more” and “please”. Surprisingly enough, these signs all revolve around anything happing with food!!! We are starting to notice such a difference between having a daughter and a son! She seems to show such an interest in dancing and music! She is also drawn more to animated musical things on the tv screen. She has a love for ponies and balls which leads us to believe we’ll have a sensitive athlete!!! Tayden was more interested in toy animals and cars at this age. 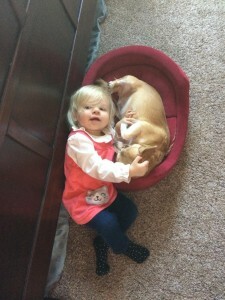 Evalyn has this immense LOVE for the dogs and her and Lilly really seem to have a special relationship; this is why I’m not surprised that “yee yee” is one of her first words! She loves her naps and lays down so nicely. She still appreciates to take 2 naps a day (knock on wood) and will go pick up her blankie and stuffed giraffe when I ask her if it’s time for a nap. She’ll then walk to the gate and wait for me to open it to go downstairs. My favorite part is that when I walk her to her room, she lays her head on my shoulder. Bless her heart! I’m hoping she always sleeps this well as Tayden is the exact opposite when it comes to sleeping! Eva always seems to be happy and loves her family. 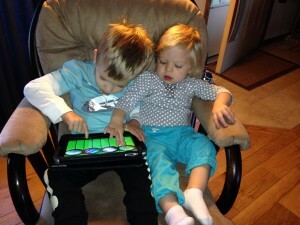 She enjoys ‘trying’ to play with her brother and her favorite thing is confiscating his ipad to play with the piano app! We need to be careful with these two kids! They will soon become more efficient with the technology than … well me, as it’ll take some time before they surpass their daddy! Our sweet baby girl is such a delight and we couldn’t be more lucky!